This University is one among the two open universities in Thailand. It was established in 1971 and named after the name of King Ramkhamhaeng the Great of Sukhothai who is credited for the creation of Thai alphabet. Before this university’s foundation, there was crisis of seats in the universities of Thailand. Now this university has 525,000 students. It is in the eighth position in the top 10 list of universities by enrollment. Founded in 1971, Ramkhamhaeng University (RU), which was named after King Ramkhamhaeng the Great, renowned for inventing the Thai alphabet, is the country’s largest university, one with a global reputation for academic excellence, which has assured its status as an “academic marketplace”, with admission open to all. Based on the principle of “equality of opportunity” to all regarding higher education, RU provides teaching and learning systems both on-campus and via distance learning. The university teaches a wide number of subjects in the social sciences and humanities, and also offers courses in all the major branches of science as well, including engineering and health science, and provides international programs, both at the undergraduate and graduate levels. This is a goal that Ramkhamhaeng University is continually striving to achieve without compromising academic excellence in any way. One of the university’s objectives is to provide students with the requisite skills, knowledge and professional competence, as well as a sense of ethics that they need to achieve fruitful and satisfying careers. 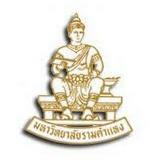 At present, Ramkhamhaeng University offers Bachelor’s Degree Programs, Master’s Degree Programs, Ph. D. Programs, International Programs and Pre-degree Programs in 10 Faculties and the Graduate School. In addition, the university also provides a wide range of excellent academic and administrative support facilities, total of 18 Institutes/Offices /Centers. The total number of students enrolled at Ramkhamhaeng University is approximately 430,000 each year, consisting of nearly 400,000 undergraduate and 35,000 graduate students. Given its long–standing commitment to providing equal opportunity in the field of education for all Thais throughout the nation, since 1995, guided by the vision of the Former President Rangsan Saengsook, Ramkhamhaeng University, in cooperation with government agencies and members of the private sector in the region, has established 22 RU Regional Campuses, in Honor of His Majesty the King, covering all regions of Thailand, as well as 36 regional examination centers. The university provides various Special Programs at the Bachelor’s and Master’s Degree levels, as well as short-courses, in 47 provinces, as well as in Bangkok; RU’s Special Programs are well-known and constitute a role model for supporting lifelong learning for all. The overall aim is to make a wide variety of academic services available to the community and to society at large, and to foster the development of human resources, both in the public and private sectors. Based on the global vision of the Former President Rangsan Saengsook, the University has expanded in terms of providing equality of opportunity in higher education, not only throughout the country, but worldwide as well. The university also provides opportunities for Thais residing overseas, having been in the process of expanding Ramkhamhaeng University worldwide since 2003; as a result, the university provides undergraduate and graduate programs of study for Thais in 27 countries worldwide, having 36 examination centers in those countries. In this regard, the university has received generous support and assistance from Royal Thai Embassies and General Consulates in these countries, as well as the Ministry of Foreign Affairs. Also, in honour of His Majesty the King, Ramkhamhaeng University has also established an Overseas Academic Services Center to oversee this venture. Ramkhamhaeng University has developed in a rapid and efficient manner in terms of academic standards, curriculum development, research, teaching and learning systems, and quality assurance, as well as the campus sites (including RU Main Campus, RU Bang Na Campus, and RU Regional Campuses) etc. As an institution on a par with international standards, Ramkhamhaeng University is currently expanding the frontiers of education in every way, while maintaining a reputation for academic excellence. In line with the current era of globalization, the latest technology is employed in order to improve the academic and administrative work of the university, as well as to transform Ramkhamhaeng University into an e-University. With the educational technology that Ramkhamhaeng University has developed and continually refined, the university is now ready to make Thailand’s vast knowledge base available to Thai communities around the world, placing Ramkhamhaeng University firmly at the forefront of the trend towards distance learning in Thailand. This is in line with its policy of becoming a fully-fledged e-university that is committed to the support of learning as a lifelong pursuit.